We are looking for volunteers to join our team in both The Club and The Yard. Slightly different skill-sets are needed for each volunteering opportunity but they both work towards the same vision - to unlock the youth's potential and to help them truly know their self-worth. Volunteers are the heart and soul of Solas Project, and without their generosity and skills it would be impossible for us to achieve our vision. The Yard supports young people by equipping them with the necessary skills required to get and hold down a job. These skills range from woodwork and bike repairs to punctuality and teamwork. Working with young people from the ages of 6-23, each day in The Yard is guaranteed to be different! 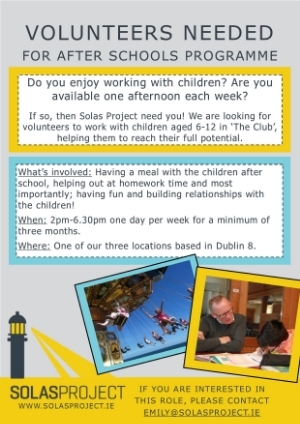 For more information or to fill in a volunteer application form, please click here or contact emily@solasproject.ie. The Club provides a safe home-like environment after school each day for children living in challenging circumstances. Catering for over 40 children between our three locations in Dublin 8, The Club is always a hive of activity and lots of fun to be a part of!